Texas Gov. 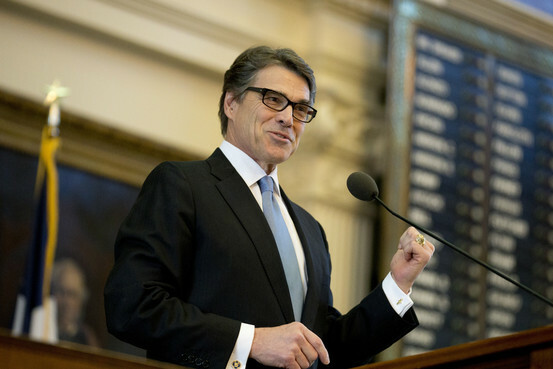 Rick Perry gives his final speech to the Texas legislature on Thursday. As Rick Perry prepares to step down as the longest-serving governor in Texas history, he met with The Wall Street Journal to discuss his presidential ambitions, his nuanced stance on immigration, his economic record, President Barack Obama, and more. Below are key portions of the interview, which has been condensed and edited. You can also read the related WSJ article. The Wall Street Journal: You’ve said in the past that you would make a decision or an announcement about a 2016 presidential run in May or June. Are you rethinking your timing? And if you don’t run, what are you going to do to stay a part of the conversation? Rick Perry: I don’t think the governor of Texas, whether it’s a current governor or will-be former governor by Tuesday, will have any problems continuing to stay in the conversation about the future of this country. I really don’t pay much attention to other folks who may or may not get in the race. My timetable’s still May-June. We’re going to continue our preparatory process. We’ll continue to meet with policy experts and men and women across the country. We’ll continue to be engaged in a conversation about the issues of the day, whatever they may be. WSJ: How do you wall off potential staff members for a campaign? What else do you do during those months? RP: I have said that the addition of Jeb Bush or Mitt Romney adds to the field. These are capable, good individuals. Potential staffers know that. We’ll just quietly go about our business and continue to prepare. WSJ: A lot of people view Bush and Romney as more moderate. A lot of people view Huckabee as the evangelical candidate. How would you stand out in a field that could be pretty large? RP: The American people have to be asking: What are you looking for? Would you like to have somebody get America back on track from an economic standpoint? I would think that the last 14 years of Texas economic history might be rather interesting to a lot of Americans. Do we want to have somebody that’s got a military background that the men and women who wear the uniform know that there’s going to be a strong supporter of them in the White House? I think the conversation needs to be with the American people rather than which candidate’s going to fill which lane. It’s a pretty broad road out there. We’re in the wilderness. And Americans are looking for someone to take them back to a pathway to prosperity, a pathway to security — and that’s the conversation. I’m pretty comfortable sitting down with the evangelical community as well. I’m pretty comfortable at the appropriate time talking about a really bright future for this country. Whoever we choose as our nominee needs to express a great, positive vision for this country. WSJ: If you were elected president, would you want to reverse what Obama has done through executive action on immigration? RP: I think you have to send some clear messages about what the federal responsibility is. The first thing you do is deal with border security. Because the federal government has failed so miserably in sending the message to the citizens of this country that we’re going to secure the border, Texas has had to step in. So, I already have a track record of action when it comes to the security of the border and the safety of American citizens. That would be my first action — to send a clear message that we’re going to secure the border. And then you can have a conversation about which of these actions are appropriate or not. Americans want to have a thoughtful process in place, following the rule of law to allow people to immigrate to this country… in a legal way. There’s a lot more that needs to be done other than just unspooling his executive action. WSJ: If you think back to where you were in 2011 on opening pathways to citizenship, do you feel like you’re different? RP: I did a poor job of explaining why Texas made the decisions that we made in 2001 [when the Texas Dream Act, which grants in-state colleage tuition for undocumented immigrants, was passed]. This was an economic decision that the people across the way made. You have to have an understanding of how we arrived at that place. Because of Washington’s absolute failure to put policies into place to secure the border, states had to then make decisions on how we’re going to deal with these people. And we looked at as there are two options here: You’re either going to send the message that young men and women who ended up in this state in most cases by no action of their own, they had done the work, they were qualified to go to these Texas institutions of higher learning. And we could either say, ‘You have worked hard, and you’re going to pay in-state tuition – this isn’t a subsidy, you’re paying the same thing as anyone else – and you’re going to get in line to become an American citizen. That made economic sense to us, considering all of the other options that we had. I still think that in 2001, that was the right decision to make. That’s the right decision for Texas. Oklahoma may make a completely different decision. WSJ: You said in 2011 that people who didn’t support that were insensitive or didn’t have a heart. RP: I said they didn’t have a heart, and that was a really bad choice of words. WSJ: What would you say now? RP: I would say just what I said to you – that this was an economic issue and I hope that a person intellectually would look at it and say that we may not agree with it, but we understand why you made it, and it didn’t have anything to do about their heart. It had to do with an intellectual decision about the economics of this state, and I apologized for that statement then. WSJ: Do you think that a Republican candidate who supports a pathway to citizenship could get the nomination? RP: I think a candidate better be talking about securing the border and having a plan to secure the border before they ever have a conversation about what’s next. I’ll let the electorate make that decision. When I travel across this country, there is nothing that we have done in this state — and we have done amazing things here economically — but nothing gets a more passionate response from people, from New Hampshire to South Carolina to California than what we did in response to the federal government’s failure to secure the border. WSJ: Do you think that a candidate who supports Common Core could get the Republican nomination? RP: I think there’s a broader principle here. Do you believe that decisions that aren’t enumerated in the Constitution need to be decided in Washington, D.C., or do they need to be decided in the states? I’m strongly in the camp of, the states need to be where those decisions are made – not just in education but in a host of other areas like health care. I think it’s a good, broad conversation for us to have with the electorate and to really discuss this whole concept of federalism. Our founding fathers didn’t mean for it to be the way it is today. Do you think it’s better for someone in Washington, D.C. to decide what the curriculum is over here in Bryker Woods Elementary or do you think it would be better that the legislature and the governor and the people of this state made that curriculum decision? My instinct is it’s going to be overwhelmingly the latter, rather than the former. Candidates who think that Washington is where all of this wisdom should emanate may have a difficult time convincing a Republican primary voter that they’re who they want to have as their nominee. WSJ: You’ve made the Texas economy a central part of your argument as to why voters should take a second look at you. Do you think that voters should judge all of the governors in the race by how their states’ economies are doing? RP: What’s the important thing in people’s lives is having the opportunity to have a good job to take care of your family. I humorously tell people all the time – realistically but humorously – that if you want to live in a state that’s got high taxes and an onerous regulatory climate and public schools that are deteriorating, then you’re free to go live in California. Someone in California who does think that more government is better and bigger government is better, they may not care as much about the freedom that comes with having a good job. But my instinct is that there’s enough people in this country, there’s a majority of the people in this country that do care about that. That is, they want to have a government that just works. That’s generally a smaller government, one that costs them less money. I’ve said numerous times over the years that my goal would be to make Washington as inconsequential in your life as it could be. WSJ: How do you assess a state like New Jersey where the economy seems to be doing not as well and they’ve had their credit rating downgraded eight times? RP: Texas has the highest credit rating in the country. We’re AAA. That happened on my watch. I’m proud of that. We created more jobs than any other state in the nation – 1.4 million jobs created since 2007. Interestingly, if you were to back out the Texas numbers from the national numbers since December of ’07, the United States would be 300,000 jobs below water. Does your record matter? I think it does. We’re about to be at the end of eight years of taking a chance on a young, inexperienced U.S senator. And the record is not going to be particularly positive on the economic side in particular. That’s before we ever get into the foreign policy side, which I will suggest to you may be even sicker than our economic numbers. WSJ: What do you think of Obama’s effort to normalize diplomatic relations with Cuba? RP: What did the United States get out of this? Other than we’re happy for Mr. Gross to be home with his family and to celebrate Hanukkah as he did. There’s a history of this administration trading for things that don’t appear to be necessarily in our best interest. I go back and I think about the young man [Sgt. Bowe] Bergdahl. If he’s a deserter, then there’s an issue there. I understand he’s a U.S. citizen, but trading him for five known terrorists who… if they were given the chance to do harm to America, they would be more than happy to do that. I don’t understand why this administration continues to trade with people who don’t have America’s best interests in mind. Do you think there was anything more that you could have done or that could be done at this point to insulate Texas from the impacts of falling oil prices? When you look at what we accomplished from the turn of the 21st century up to 2014, we made tremendous progress in expanding and diversifying the Texas economy. I can’t think of anything more that we could have done. We tried to recruit every business that we had an opportunity to. We didn’t get them all. But we got our fair share. I think history will be kind to us from the standpoint of the tax regulatory legal policies that we put into place and the accountable public schools and the skilled workforce that was developed by that. And again, we realize that this is going to be a difficult time for some places in Texas. Midland and Odessa, there are going to be people who lose their jobs. There are going to be sectors in Houston who are hurt.